On November 10, 1910, the Ordnance Office directed the Commanding Officer of Springfield Armory to convene a board of officers”…to make tests of such automatic pistols, caliber .45, as may be presented to them for that purpose…”. The board met on November 10, 1910. This trial was of major importance. The pistols submitted were the most advanced specimens thus far developed by either manufacturer. In the case of Colt’s, the weapon was the Special Army Model 1910; the Savage pistol was a specially improved version of their Model H. Colt’s was represented by its President, Col. W.C. Skinner; two Vice Presidents, Mr. P.C. Nichols and Col. C.L.F. Robinson; plant superintendent James J. Peard; John Browning, two engineers and a mechanic were also present. Savage was similarily represented, it’s President, Vice-President, and plant superintendent were on hand; Elbert Searle, inventor of the Savage pistol, and two mechanics were present. The tests commenced with a detailed examination of the pistols; special attention was paid to the safety devices. Field strip and complete disassembly was performed and timed. The Colt was more readily dismounted for field stripping. On the other hand, the Savage could be completely disassembled in less time than the Colt. 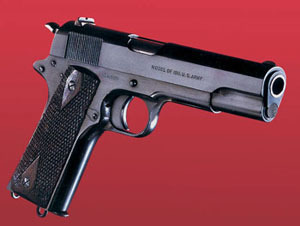 The Colt was listed as having 64 separate components, includind the magazine; the Savage had 45 components. In the next examination, the velocity at 25 feet was obtained: 858.4 f/s for the Colt, 846 f/s for the Savage. In the accuracy trial, the Colt proved better than the Savage by shooting an average group of 1.94″ compared to 2.84″ for the Savage. The penetration tests were puzzling; the Colt did better on pine boards whereas the Savage did better on solid oak blocks. In the combined accuracy-rapidity tests the Colt was faster and more accurate than the Savage. An exhaustive endurance trial was now performed. 6000 rounds were to be fired from each weapon. The firing was to be done in cycles of 100 rounds, at which time water would be poured through the barrel. After every 1000 rounds the pistol could be cleaned and oiled. In the first thousand, the Colt had 5 malfunctions, three of which were due to lack of adequate oiling. The Savage had 4 malfunctions; its sear had broken off and the right grip piece split and came off. In the second thousand, the Colt had 4 malfunctions; toward the end of that run, the barrel split and had to be replaced. The Savage had 22 malfunctions; it’s extractor broke and was replaced. In the third thousand, the Colt had 2 malfunctions; the mechanical safety broke, but this did not disable the pistol. The Savage had 7 malfunctions; grip pieces split and the bolt stop broke. In the fourth thousand, the Colt had no malfunctions, but the slide lock failed to act properly and the grip piece screws came loose on several occasions, several jams were caused by incorrect feeding, the extractor broke, and the magazine floor plate broke. Upon examination after firing, the Savage was found to have a broken barrel lug and bolt lock spring. A new barrel and spring were installed. In the fifth thousand, the Colt had one malfunction. The Savage had five malfunctions and a broken sear lock. In the sixth thousand, the Colt had no malfunctions but the grip piece screws continued to work loose. The Savage had 5 malfunctions resulting from a faulty magazine. It is interesting to note the performance of a .45 caliber Colt Revolver Model 1909, fired throughout the tests as a control. The revolver had 2 malfunctions during 6000 rounds; the first was due to the absence of powder in a cartridge, the second was due to a sticking latch. A summary of broken parts in both automatic pistols revealed that the Colt automatic pistol required 4 replacements; the Savage 13. This report was rendered on March 20th. On March 23rd, the Commanding Officer of Springfield Armory concurred. Concurrence of the Chief of Ordnance and the General Staff followed. On March 29th, 1911 the Secretary of War approved the change. Bady, Donald. Colt Automatic Pistols 1896-1955.